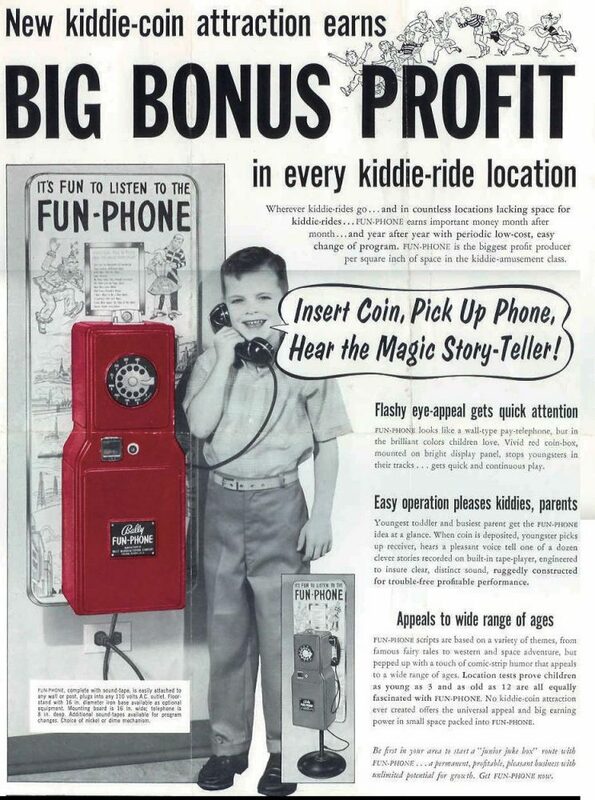 Made in 1963, this Bally Fun Phone graced the walls of the Wizard Arcade at Shoppers City West before I can remember, and I was fortunate enough to get a few pictures of the actual unit that was mounted to the wall by the Arcade entrance from inside the mall. 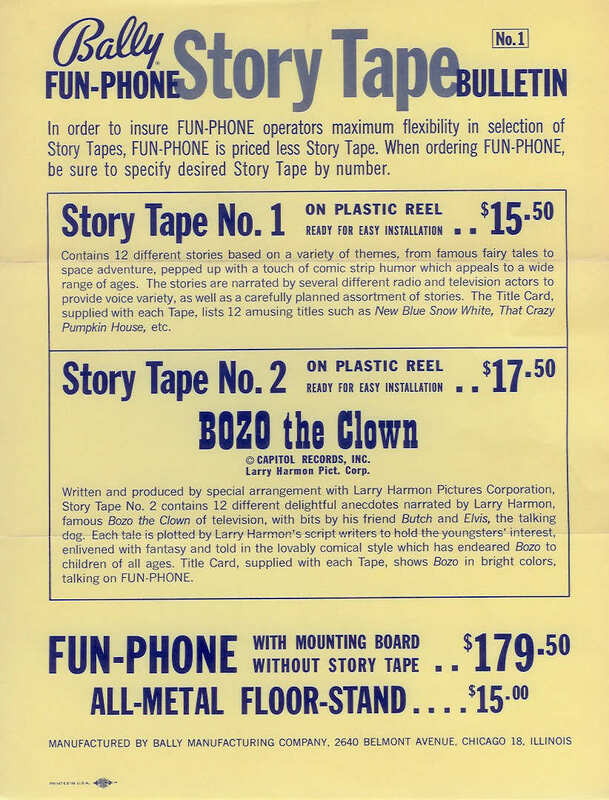 The recorded voices were done by various radio and television personalities from that time period, including Larry Harmon, TV’s Bozo the Clown! It retailed for almost $200 USD in 1963, which translates to $2200.00 in Canadian dollars here in 2019, not an insignificant investment by any means. 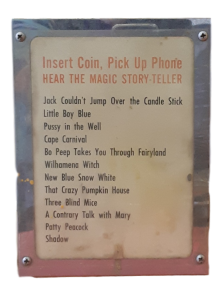 The metal stand was an additional $15.00 then, or $165.00 here and now, though it could be mounted to the wall, as it was at the Wizard Arcade. It was state of the art at the time as well. Building on reel to reel technology invented by Fritz Pfleumer in 1928 in Germany, which was in turn based on the invention of magnetic wire recording by Oberlin Smith in 1888 and Valdemar Poulsen in 1898, the endless loop tape cartridge was designed in 1952 by Bernard Cousino of Toledo, Ohio, and then revised by George Eash, also of Toledo, Ohio, and patented under the name Fidelipac in 1957. These cartridges were initially used as “broadcast cartridges” from 1959 forward for program commercials and single song hits by radio broadcasters. This technology appears to most closely resemble this system, right as the 4 track system was just making it’s way into the automobile, with early adopters to this technology including Frank Sinatra and other noteable celebrities and high rollers, only to be replaced by 8 track systems in the mid 60’s. While it is not a Pinball Machine, it is a Bally, and it resided within one of Ottawa’s great arcades from the Golden Era, and saw it all, including the advent of modern 3 inch flippers, the transition to solid state Pinball Machines, the Video Game revolution, and even the demise of Arcade Mania. As such it is a witness and fixture buried deep in the hearts and souls of all of us who ventured into that particular West Ottawa Pinball parlour and games room so many times all those years ago. If anyone has any memories of this unit at Shoppers City, feel free to leave a comment with your recollections! Enjoy the following pictures and original promotional documents from Bally in 1963.